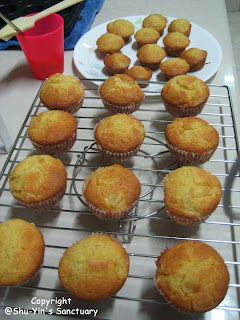 Decided to bake some muffins for mum to bring to office tomorrow for her colleague Angie. Angie has been terrific so far...giving me many valuable pregnancy and baby tips. I really value her advice. So hopefully she and her little boy will enjoy the homemade Orange and Pineapple Muffins. Was late for dinner at mum's place because I baked a few rounds. Guess I need a bigger oven. Hehe. 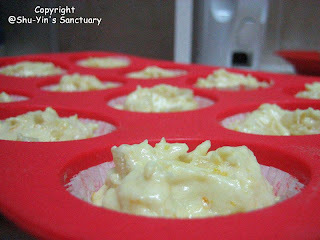 Batter which consists of pineapple chunks and orange zest. 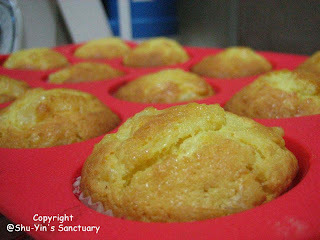 Muffins baked using the mini muffin pan. 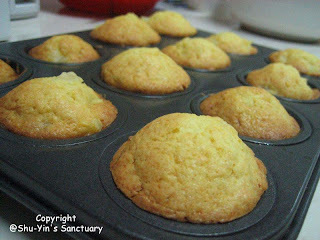 Muffins baked using the normal big muffin pan. My golden brown muffins nicely puffed up. Warm big muffins and mini muffins being brushed with the orange glaze. You know what is the thing I hate most about baking? The washing up!!! 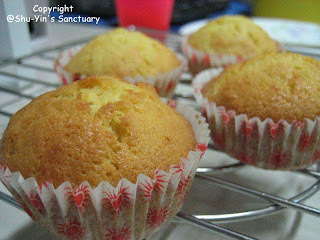 aiyoyo... cruelty.... homemade Orang and Pineapple Muffins. oopss....soli la..spelling mistake la. like dis also u saw! ur eyes hebat!